Come hungry! The evening starts with a magnificent passed menu, courtesy of Russ & Daughters, followed by the panel discussion. Each guest will receive a signed copy of Mr. Trillin's new anthology, Quite Enough of Calvin Trillin: Forty Years of Funny Stuff. Calvin Trillin, Villager, food maven, New Yorker staff writer, and celebrated humorist, he writes happily and often about Russ & Daughters. 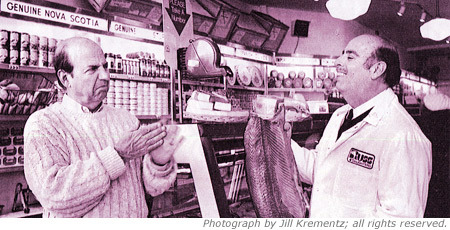 Two generations of the Russ & Daughters family: 4th Generation owners Josh Russ Tupper and Niki Russ Federman (who each left thriving careers in unrelated fields to shepherd the 100-year-old family business into its next century), and 3rd Generation Herring Maven Emeritus: Mark Russ Federman, (who ran the business for many years, after a successful career in law, and who is now retired and at work on a book The House That Herring Built).